Homeland Security: The Essentials expertly delineates the bedrock principles of preparing for, mitigating, managing, and recovering from emergencies and disasters. Taking as its starting point the content included in Introduction to Homeland Security, Fourth Edition, by the same author team, this new textbook lays a solid foundation for the study of present and future threats to our communities and to national security, and challenges readers to imagine more effective ways to manage these risks. This concise version outlines the risks facing the US today and the structures we have put in place to deal with them. From cyber warfare to devastating tornados to car bombs, all hazards currently fall within the purview of the Department of Homeland Security. Yet the federal role must be closely aligned with the work of partners in the private sector. This book examines the challenges involved in these collaborative efforts. It retains the previous version's ample full-color illustrations, but in a streamlined and more affordable paperback format. A companion website offers material for student use, and the instructor-support web site includes an online Instructor’s Guide (complete with chapter summaries and a test bank containing multiple-choice, true-or-false questions, and essay questions); PowerPoint Lecture Slides and Interactive Video; and other new case-study material created for this text. The BH Learning Library offers support for teaching your students the key skills of critical thinking, writing, and research. 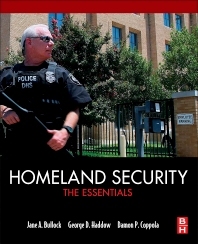 This book will appeal to students in Homeland Security and government/modern history programs; government officials and national policy-makers; private security and risk assessment professionals; professionals involved in state, federal, and private security training programs; and emergency management personnel. Students in Homeland Security and government/modern history programs; government officials and national policy-makers, private security and risk assessment professionals, state, federal, and private security training programs, emergency management personnel. Jane A. Bullock has worked in emergency management for over 20 years most recently as the Chief of Staff to James Lee Witt the Director of the Federal Emergency Management Agency (FEMA). In this position Ms. Bullock served as principal advisor to the Director on all Agency programmatic and administrative activities, provided advice and recommendations to the Director on policies required to carry out the mission of the agency; managed the day-to-day operations of the Agency; directed, monitored, and evaluated Agency strategic and communication processes; and oversaw administration of the Agency’s resources, including the disaster relief fund. Represented the Director and the Administration with Congress, State and municipal governments, foreign officials, constituent groups and the media. Served as a principal spokesperson for the Agency’s programs both before, during and after disasters. Chief architect of FEMA’s Project Impact: Building Disaster Resistant Communities, a nationwide effort by communities and businesses to implement prevention and risk reduction programs. Principal on a project to create National Disaster Response and Mitigation system for Argentina and in six Central American and Caribbean countries. Served as part of the Clinton Administration’s communications team for the Y2K issue. George Haddow currently serves as an Adjunct Professor at the Homeland Security Studies program at Tulane University in New Orleans, LA. Prior to jpining academia, Mr. Haddow worked for eight years in the Office of the Director of the Federal Emergency Management Agency (FEMA) as the White House Liaison and the deputy Chief of Staff. He is a founding partner of Bullock and Haddow LLC, a disaster management consulting firm. Damon P. Coppola is a Partner with Bullock and Haddow LLC, a disaster management consulting firm. He has extensive experience in disaster preparedness and planning through his work with the World Bank Group; The Institute for Crisis, Disaster, and Risk Management; the US Army Corps of Engineers; and the Federal Emergency Management Agency, among others. Mr. Coppola is the author of Introduction to International Disaster Management (Butterworth-Heinemann), and co-author of Introduction to Homeland Security (Butterworth-Heinemann) and Hazards Risk Management (The Federal Emergency Management Agency). He has also been published in several industry journals, including Disaster Prevention and Management, The Beacon, The American Society of Professional Emergency Planners Journal, and The International Association of Emergency Managers Newsletter, among others. Mr. Coppola holds an M.E.M in Crisis, Emergency, and Risk Management from George Washington University.